A people with a prophet or a prophetic people? Listen carefully to your own journey as a people, for it is a sacred journey and it has taught you many things you must know for the journey yet to come. Listen to its teachings and discover anew its principles. Do not yearn for times that are past, but recognize that you have been given a foundation of faithful service, even as you build a foundation for what is yet to be. As a prophetic people you are called, under the direction of the spiritual authorities and with the common consent of the people, to discern the divine will for your own time and in the places where you serve. You live in a world with new challenges, and that world will require new forms of ministry. There are two parts to this concept, a Yin/Yang, if you will–two halves that together complete wholeness, as well as the starting point for change. First is common consent through prophetic discernment by the whole body. This requires intense listening to one another as a way to listen to the Spirit. In 2012/2013 national church conferences in Canada, Australia, Great Britain, and the USA used deliberate methods to deal with questions related to ordination and marriage for people in same-gender relationships. Those were breakthrough experiences for the church and ultimately pointed to major changes in sacramental practices. The other component calls for prophetic action on social-justice issues. This latter area provides the focus for my new book, Speak to the Bones: How to Be a Prophetic People in a Time of Exile. 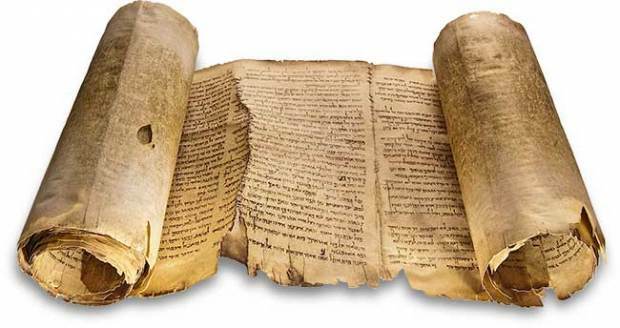 I use the examples of ancient Hebrew prophets to identify the principles and practices to speak a “word of God” in our 21st-century societies and then act on it. Each generation faces some great work, some heroic challenge that summons its children to courage and creativity. The great work of this generation will be to respond to the quadruple threat inherited from previous generations: an ecological crisis that, left unchecked, will lead to catastrophic environmental collapse; an economic crisis of obscenely increasing inequality that exploits or excludes the world’s poor while dehumanizing the rich as well; a sociopolitical crisis of racial, ethnic, class, religious, and political conflict that could lead to catastrophic war; and a spiritual and religious crisis in which the religious institutions that should be helping us deal with the first three crises either waste our time or make matters worse. There is wisdom in such counsel, of course. There is wisdom also in these words attributed to Jesus: “For those who want to save their life will lose it, and those who lose their life for my sake will find it” (Matthew 16:25 NRSV). Can we take these words as including “the church”? If so, how do we bridge the gap? To accept the challenge of truly being a prophetic community is risky business indeed. Would it be best to wait until the church’s financial spreadsheets offer a more favorable report? Naturally, some would jump in at this point to argue we should have been more frugal in the past. That discussion may not be helpful in moving forward. In any event, I don’t have answers for all the questions and issues raised in this regard. That would appear to be an ideal scenario for prophetic discernment. What I do know is I wrote Speak to the Bones in response to what I felt was the urging of the Spirit. I care deeply about my faith community and what is happening in my larger community, nation, and the world. The example of prophets such as Nathan, Elijah, Amos, Hosea, Jeremiah, and others gives me hope that we 21st-century folk can when necessary speak truth to power and challenge inequality, injustice, and idolatry. Our faith community, which began as a movement during the Second Great Awakening, continues to cherish and uphold a vision of Christ’s peaceable reign. God hasn’t given up on us so far. Neither should we. 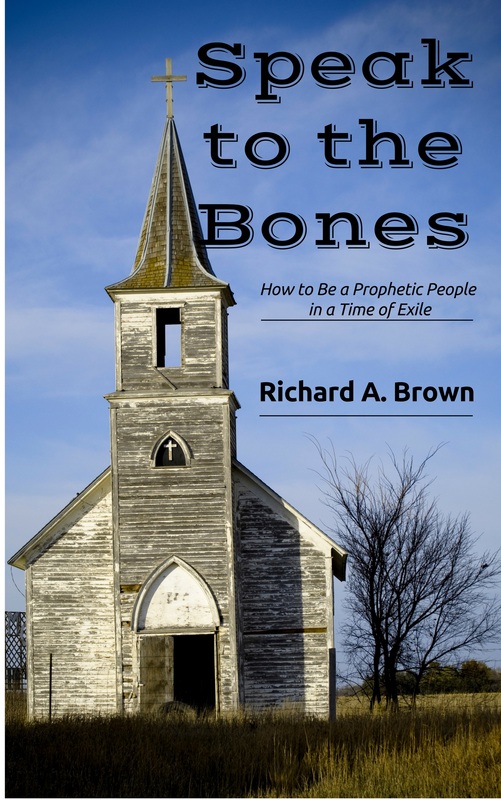 Speak to the Bones: How to Be a Prophetic People in a Time of Exile is up on Amazon in both print and e-book formats: 161-page Book ; Kindle e-book.The experiences of ancient Hebrew prophets are presented as a guide for modern-day prophetic communities to engage in social-justice action. Each of the 10 chapters includes questions for reflection and discussion, making this great for class use. Recently I was invited by the moderators of the liberal Mormon blog Wheat & Tares to be a guest contributor on issues related to Community of Christ. This post, published earlier today, is my first contribution for them. Thirty years to the week after approving priesthood ordination for women, the Community of Christ is extending the sacraments of ordination and marriage to gays and lesbians in the United States. A two-year interim period begins on Monday, March 31, after which it will be reviewed and considered for permanent status. This follows similar action resulting from national conferences in Australia and Canada. Lessons learned from what turned out to be a tumultuous (many might say disastrous) beginning for the 1984 landmark event have been put into place by CofC leaders today. Although a few church members in recent months have either turned in their priesthood cards or left the church, it’s nothing like the major exodus that took place three decades ago. For starters, this time there was a three-year preparation period leading up to a special USA National Conference held right after World Conference in Independence, Missouri, last April. 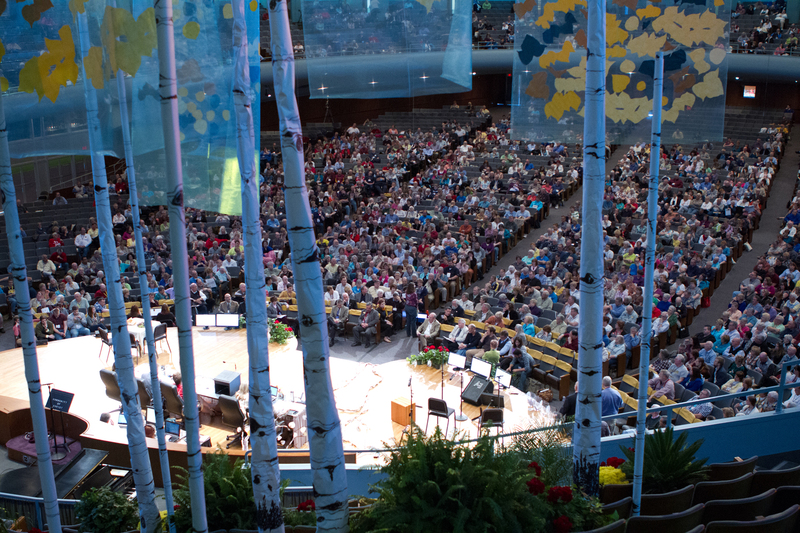 The 2,000 USA delegates spent several days listening, testifying, and worshiping together before overwhelmingly recommending that the First Presidency and the USA Team of Apostles issue the changes. The official conference report is here. Here’s the specifics: The marriage sacrament is authorized for individuals in a same-gender relationship wherever such civil marriage is legal. Elsewhere CofC congregations may celebrate a special covenant/blessing worship experience. And ordination can be extended to individuals with same-gender orientation who are either in a committed, long-term relationship or who are celibate. For those wondering, the same rules apply to straight folks. “Wonder” wasn’t exactly the operative word for traditionalists and conservatives. Already suspicious of what they viewed as dangerous liberalizing tendencies in the church for at least two decades, they were incensed and vowed to fight the move every way possible. Business meetings in congregations, districts, and stakes where priesthood calls for women were presented often turned into angry shouting matches. People made sure every one of their baptized children was on hand to vote yes or no depending on the parents’ direction. My own stake (Blue Valley, which included a portion of Independence and eastern Jackson County) had its rules of operation suspended because people simply couldn’t get along. It was a sad, ugly, and unfortunate time even while marking a new era of broadened ministry in the church. Today women and men serve alongside one another. If you didn’t know what happened decades ago, you’d probably never suspect there was anything unusual about the way priesthood functions now. Numerous resolutions on same-gender issues were submitted to the past few World Conferences but were ruled out of order by the First Presidency, mainly because they were considered important to church members in a select few nations rather than as something critical for the international church. The CofC has an official presence in more than 60 nations. In 2010 inspired counsel to the church called for creation of national conferences, specifically to consider issues related to same-gender orientation. With somewhere around half of all CofC members living outside the Western, industrialized countries in North America, Australia, and Europe, this was believed to be the only way same-gender issues could be dealt with in the church. Delegates at the USA National Conference engaged in a unique process aimed at reaching “common consent.” This meant that a significant majority (at least 66 percent) would have to make a recommendation for top church leaders to act. In mid-March of this year, the five apostles responsible for USA mission centers sent a copy of President Stephen Veazey’s “Statement to the Church: National Conference Recommendations and Interim Policies” to priesthood members. It was mailed to all USA pastors and high priests, evangelists (referred to as patriarchs before women were ordained), bishops, and seventy. They presented the president’s statement as “inspired by the Holy Spirit.” A DVD titled “President’s Reflections” will be available in April to church members and include four sections: Let Me Be Clear, What Does the Lord Require of Us, My Personal Testimony, and Room for Everyone. President Veazey’s statement, which spills over onto a fourth page, is essentially a point-by-point counter to criticisms of the new same-gender policies. Doctrine and Covenants 111 provides instruction regarding marriage in the church. It is a statement written in the mid-1830s to counter rumors about adultery and polygamy in the church. Same-gender marriage was not conceivable, much less a question, in early 19th-century thought. To conclude that Doctrine and Covenants 111 definitely resolves the question of same-gender marriage ignores its historical context and stated purpose. Also, although Section 111 was included in the Doctrine and Covenants, its historical preface clearly states it was not a revelation. Let me be clear. Continuing Revelation approved by the World Conference means those particular Bible verses are not the final word on these matters. Such verses now are understood through insights offered in Continuing Revelation approved by the church…. However, the real issue was not just several Bible verses, but how we understand and apply scripture. applies to the verses used to deny persons of same-gender orientation access to all sacraments. It also applies to situations where scripture verses are used by some to dominate, oppress, or exclude others who are different from them. Because the World Conference approved Section 163:7 as an expression of God’s will, the Bible verses most often used to categorically denounce same-gender orientation and relationships no longer should be presented as the final word on these matters. No doubt people both inside the CofC and outside it will be examining these words and trying to read between the lines. For me, it’s clear that “Continuing Revelation” is the most important consideration for the church as it deals with these and other critical issues. It reminds me of an essay by theologian David Ford who described religion as God speaking to us from the past. Think of that as the accumulation of scripture, church tradition, and wise people who’ve used reason and intelligence to bring the church to where it is today. Ford identified revelation as God speaking to us from the future. Ford cited the example of the apostle Paul who claimed authority as an apostle through direct revelation from the risen Christ rather than an institutional authority handed on to him from Peter and the other apostles in Jerusalem. 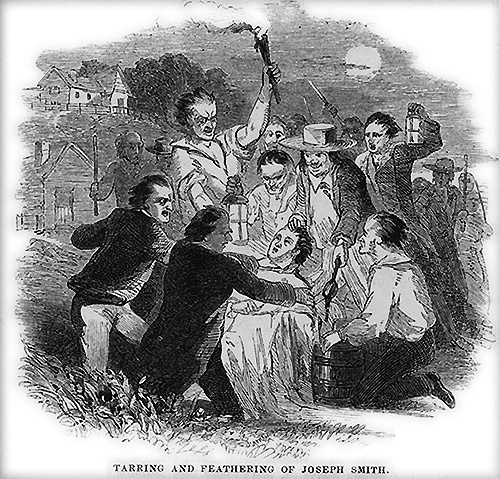 To that I would add the experience of Joseph Smith Jr. in the early 19th century, who served as God’s instrument in bringing forth a “great and marvelous” new work. We are all caught somewhere in between religion and revelation, and every church/denomination finds its own point on the continuum. With this “Statement to the Church” President Stephen Veazey is not only prompting the Community of Christ in an obvious direction but in a curious way he mirrors the examples of Apostle Paul and Joseph Smith in challenging the church to understand more fully what it means to be a prophetic people. The prophet spoke to those who had returned to Jerusalem from exile in Babylon. Resettlement in their homeland and the rebuilding of a temple hadn’t turned out to be quite as glorious as they’d hoped. Stark reality was setting in. Their nation would never be truly independent. Jerusalem would never be as prosperous and important as in the glory days under David and Solomon. And the new temple could never match the remembered magnificence of the original. That’s why the people were “mourning in Zion”: the good old days would never return, and that represented the shared failure of both the people and their God. In a sense it represented the death of a dream based on collective memory. Human nature being what it is, those hopes were flawed from the beginning. What the people had to do, the prophet counseled, was to build something new without forgetting where and what they’d been in the past. That included both “golden years” (tempered by the perceived memories of several generations) and the painful challenges of exile. Out of that would arise a new covenantal relationship with God. The leaders and members of Community of Christ can learn something important from this ancient text from the Hebrew Scriptures. For us it requires discernment by a prophetic people. That term has been bandied about in the church for quite a while, and it’s now time for us to finally grow into that challenging role. Many folks within the church still long for our own version of the “good old days.” That’s understandable, I think. Look around in just about any of our congregations on a Sunday morning and you’ll find far fewer bodies in the pews or chairs than there were two or three decades ago. We all know (or, let’s face it, are related to) now-former members who left over disagreements about women’s ordination, open Communion, changes in baptism/confirmation rules, church membership in the National Council of Churches (USA), or any number of less major or more local issues. Or maybe it’s because the church doesn’t emphasize tithing statements, or the Book of Mormon, or the “Old Jerusalem Gospel,” or the Word of Wisdom, or the exclusive authority of priesthood, or, well, just fill in the blank with lots of other choices. We’re about to convene a World Conference in which one of the resolutions calls for “liberalizing” restrictions on the social use of alcohol by priesthood members. My grandmother is no doubt spinning in her grave. I doubt if there’s a current longtime church member who couldn’t insert the name of the dead relative of their own choice in that sentence, as well. That’s just one of the issues we’ll debate. Then immediately after World Conference ends, delegates from throughout the USA church gather to discuss the possibility of marriage and priesthood ordination for people in same-gender relationships. If most of our dead relatives weren’t spinning before…. There are different ways of looking at all this, but the first one that comes to mind for me is that a sizable chunk of Community of Christ members are in mourning. Maybe it’s because of all those changes; maybe it’s because those changes haven’t gone far enough. Perhaps it’s because of all the folks who’ve angrily stomped out the front doors of our congregations during the past three decades or so. Or perhaps it’s for all the others who’ve much more quietly drifted out the back door, tired of the constant bickering and accusations, weary of patiently waiting for the kind of transformation they believe the church sorely needs. Maybe they were just tired of carrying heavy loads without much help. Of course, change simply for the sake of change is wrong. But so is longing with flawed memories for a golden era or “good old days.” While it’s true that the church has changed, it’s time to recognize that our society and culture have changed even more. And so what it means to be the body of Christ and the people of God in the 21st century will challenge us in ways even our recent ancestors could never have imagined. My own childhood in the late 1950s and 1960s represented a time when the then-RLDS Church was constructing buildings practically nonstop. My congregation was one of a handful of churches in our small town. Today it’s a sprawling suburb with 50,000 residents, but back then just about all of the 2,500 or so folks identified with one of those churches. Most people were in church every Sunday morning (Catholic mass on Saturday evening served the same purpose). There were Sunday evening services and Wednesday night prayer meetings, Scouts on Monday nights, priesthood visiting on Tuesday, monthly Women’s Department meetings on Thursday evenings, and in the summer volleyball or softball games on Friday night or Saturday. In short, social life centered on church activities. Even in small towns today that’s rarely the case. Active church members now often find themselves uncomfortably out on the margins of society not at its core running the show. A majority of Americans today are no longer regular church attenders. Even that term has been redefined to mean once a month or maybe a few times a year. This is by no means a Community of Christ phenomenon. Why, even the Southern Baptists have a shrinking membership. 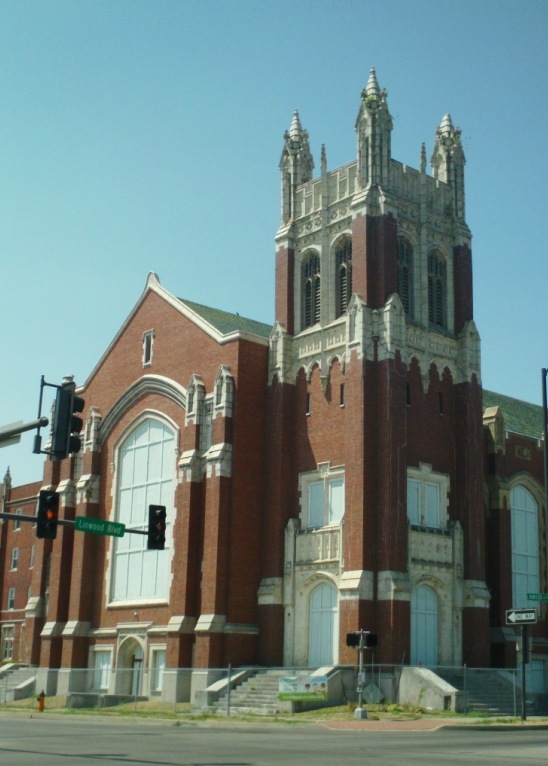 Many of those churches we built back in the 1950s and 1960s are underutilized, in need of major repairs, or being closed. The chief financial supporters in many congregations are growing older and dying off. Young adults are not returning to the church once they marry and have children the way previous generations did. As a result, many faithful members wring their hands and, yes, mourn. Yes, I know there’s lots of people worried about what’s going to happen at these two conferences. Much of it can be stated in the form of “If this is approved/recommended, then….” I don’t have a crystal ball to see how it will all turn out. There will be some folks who will be unhappy and others who are happy; most likely there will be a fair bit of confusion and worry. And probably a little mourning for the good old days, whatever that means, or for what might have been. I believe the bottom line is this: It’s time for Community of Christ to step up and become the prophetic people we’ve only talked about in the past. Oh, and one more thing: We really need to get over ourselves. Rich Brown writes a weekly lectionary blog, ForeWords. On Wednesday, May 11, President Steve Veazey released a Letter of Counsel Regarding the Presiding Quorums in which Barbara L. Carter was called to be an apostle. In a related move, Apostle Scott Murphy was named as Director of Field Ministry and Apostle Linda Booth, as C-12 secretary, will serve as acting president of the quorum until September when quorum members select officers. New field and ministry assignments for the Twelve are listed here. Earlier this week Community of Christ President Steve Veazey announced that Jim Slauter, president of the Council of Twelve Apostles and director of Field Ministries, has resigned from those positions and will be retiring from World Church appointment. The resignation and retirement will be effective August 1, 2011. Brother Slauter requested this action so that he and his wife could give greater attention to the ongoing medical needs of their five-year-old grandson Matthew. Jim was set apart as president of the Council of Twelve at the Special World Conference in June 2005 (at that Conference Steve Veazey was called from his then-position as president of the Council of Twelve to assume the position of president of the church). Jim was called and ordained as an apostle at the 1996 World Conference. He first accepted World Church appointment 24 years ago. The full text of the “Letter of Counsel Regarding the Presiding Quorums” is here. Jim Slauter’s letter of request is here. A letter of support from the remaining eleven members of the Council of Twelve is here. Although no official announcement was made, it appears the vacancy in the Council of Twelve will not be filled until the next World Conference, scheduled for April 2013. The positions of council president and field-ministries director presumably will be filled by current members of the Twelve, at the direction of the First Presidency. The boundaries separating Community of Christ from other Christian denominations have just gotten considerably more porous. Last week CofC leaders released details on new procedures for church membership for Christians previously baptized in other denominations. An interim policy takes effect January 1, 2011, and will be valid through the following August 31. On September 1, 2011, an official policy becomes effective. It is anticipated that a new church-members introductory course will be available by that time, and all new prospective members will be required to complete it. Until then existing resources (Walking with Jesus: Disciples in Community of Christ and Sharing in Community or We Share: Identity, Mission, Message, and Beliefs) may be used by local authorities. A key element in both the interim and official policies is that this procedure is only for those people who were baptized (1) at the age of eight or older and (2) their baptism involved water [full or partial immersion, pouring, or sprinkling]; in other words: infant baptism does not qualify. All people seeking membership in Community of Christ in this way must agree to a Shared Understanding of Baptism statement. Included with the official announcement of this significant policy change was a letter from church president Stephen M. Veazey. In it he explains how the policy came into being, its direct connection to Doctrine and Covenants Section 164 (approved in April 2010 at World Conference), and a brief personal reflection. On November 10, delegates to the General Assembly of the National Council of Churches U.S.A. unanimously approved Community of Christ for membership. A report by a NCC committee recommending approval is here (the report also includes the church’s “We Share” document). The NCC report makes for interesting reading, particularly the section that notes that the Community of Christ’s “founder” was not Joseph Smith Jr. but Joseph Smith III (admittedly, this information is provided by a representative of Roman Catholic bishops and excerpted from a letter by him to the committee). The announcement on the church’s Web site is here. While this announcement is not totally unexpected (recall that the NCC’s general secretary, the Rev. Dr. Michael Kinnamon, addressed the CofC World Conference this year and expressed his strong support for this step), it does represent a significant (some would probably substitute “radical”) development in RLDS/Community of Christ history. These separate announcements are not simply administrative actions, of course. There are major theological and historical issues involved. Clearly there are those who view this moment in the church’s long history as a leap into religious maturity while others see it as damning proof of apostasy. Perhaps in both cases this becomes a core question: Now that the Community of Christ allows church membership for Christians without requiring rebaptism and the denomination is a part of the National Council of Churches USA, what difference is that going to make as the church (understood as a worldwide communion, national churches, mission centers, congregations, and faith movement) moves ahead? In its shortened form, it’s simply this: So what? The growing fear, intolerance, and violence throughout the world alarm the Presidency and the Council of Twelve. Recently, young people of homosexual orientation have been harassed to the point of suicide. In some areas of the world homosexuals are beaten, jailed, or killed. Also, some churches recently have increased the volume and frequency of their condemnations of gay, lesbian, bisexual, and transgender (GLBT) people. The church has not always provided clear assurance that our faith community and congregations should be safe places and sanctuaries of peace, where people need not fear embarrassment, harassment, or blame because of their sexual orientation. Our mission is to Proclaim Jesus Christ and Promote Communities of Joy, Hope, Love, and Peace. Therefore, it is vital that we engage in words and actions that “uphold the worth and giftedness of all people and that protect the most vulnerable” (Doctrine and Covenants 164:6a). We must work to ensure safe and peaceful congregations and communities for all of God’s children, including our GLBT members and friends and their families. We may not agree on all questions related to human sexuality and sexual orientation. However, we are earnestly seeking more insight and understanding. We invite all members and friends of Community of Christ to join us on this journey.